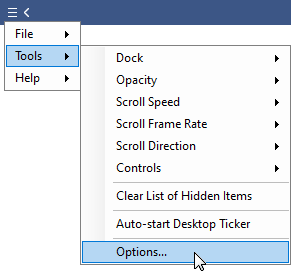 Click the menu button and select Tools, Options. Specifies how often the RSS feeds are reloaded to get the latest content. Specifies how far the ticker should scroll when the mouse wheel is moved. Note that on versions of Windows earlier than Windows 10, Desktop Ticker must be active window for the mouse wheel to have effect. More information here. Specifies whether vertical lines are shown between feed items in the ticker. Specifies whether the ticker stays on top of other applications. Specifies when the application is displayed in the Windows taskbar. 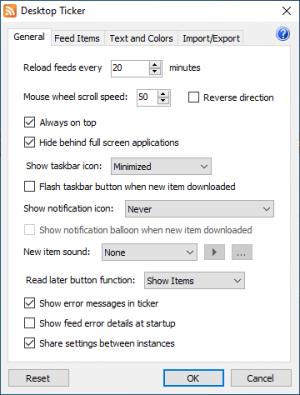 Specifies whether the taskbar button flashes when a new item is downloaded. Specified when the application is diplayed in the Windows notification area. Specified whether a notification message is diplayed when a new item is downloaded. New Item Sound allows you to select a sound that is played when a feed is updated. The options in the list correspond to the sound settings in the Windows Control Panel. Custom allows you to select a WAV file to play, which can be up to 10 seconds long. Specifies whether details of errors loading feeds are shown in the ticker. If unticked, errors will only be shown when leaving the Manage Feeds window. Specifies whether details of errors loading feeds are shown when the application is started. Specifies whether the list of RSS feeds is synchronised with the Windows Common Feed List (CFL). The CFL allows you to share a common list of RSS feeds with different applications, and to subscribe to new RSS feeds directly from Internet Explorer. Learn more here. Specifies whether to show only items that have been published within a certain amount of time. Works in conjunction with the New & Recent Items settings on the General Options page. Specifies whether to display the feed title as text, image, or both. If Image is selected and a feed does not have an image, the text is displayed instead. Specifies whether to display the feed items as text or text and image. 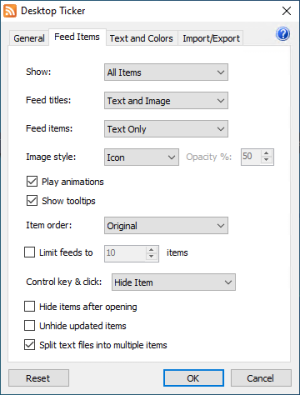 Specifies whether the feed images should be displayed as an icon next to the text or as a background behind the text. If backgound is selected, the opacity of the image can be specified. Specifies whether animated GIF images should animate. Specifies whether a summary tooltip is displayed when the mouse cursor is over a feed item. Specifies the order that the items are displayed in for each feed. Specifies the maximum number of items that are displayed for each feed. Specifies whether items should be hidden from the ticker after being left-clicked. Specifies whether items that have been hidden should be unhidden when the article is updated. Specifies whether to display the first line only or an item for each line when displaying a text file. 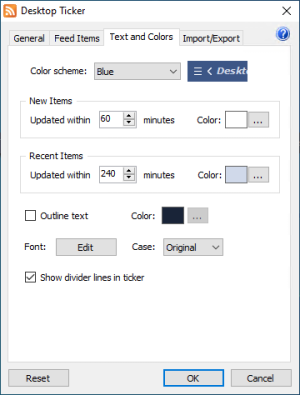 Colour scheme allows you to select one of three appearances for the ticker, Windows which uses the current Windows settings, black, or custom where you can choose your own colours. In the New Items section, you can specify the age of feed items that are to be classed as new, and the colour these items are to be displayed in. The same options can be specified for older items in the Recent Items section. These settings along with the Show option determine which items are shown in the ticker. Specifies whether to outline the text in the ticker and what colour. Click to change the type and size of the font used for the text in the ticker.